Nancy Lewis was a Hopi potter from the First Mesa village Sichomovi. She was actively making pottery between 1960-1980. Several of her pottery vessels are in the collection of the Museum of Northern Arizona in Flagstaff. 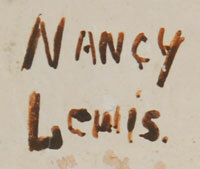 She usually signs her work Nancy Lewis on the base.